Angel sounds like a cuddle kitty! 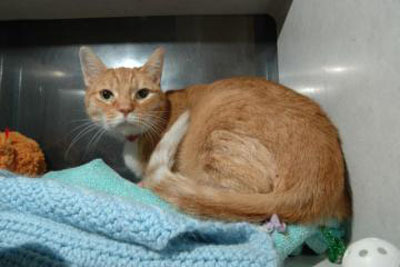 Angel is a 10-year-old orange and white female cat. She came to Lollypop Farm because her owner moved and didn’t bring her along. Angel has a lot of kitten left in her. She loves playtime, especially with her purple mouse! This little lover also enjoys quiet time, and will make an excellent lap cat. Angel is eligible for our Seniors-for-Seniors program, so approved adopters 60 and older can bring her home free of charge! If you’re in search of a cat that thinks she will always be a kitten, loves play and cuddle time, look no further! Come meet Angel today…she can’t wait to become a part of your family! Pepper, the dog from last week, is still waiting to be adopted.